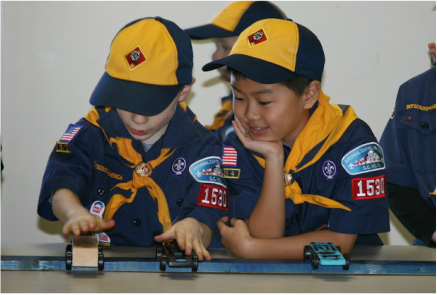 The Pinewood Derby is the quintessential Cub Scout event. Every year across the country, Cub Scouts take a small, plain block of soft wood and create a clever derby car design of beauty and speed. The car is then judged in concours (design) and raced against his peers of the same age on a precision raceway with digital timing. Okay – what really happens is the boys and their parents get to spend quality time together – planning a car design, executing it using simple hand tools (and maybe a Dremmel tool), and having fun seeing how fast it goes. The more of the car the boy does, the greater the sense of accomplishment he feels on race day (win or not). The Derby is held over two days in mid-January. Friday night (from 7-9 PM) is an opportunity for each scout to check his car to make sure it adheres to the rules and to take several test runs on the track. There are scales and basic tools available so the boys can weigh their cars and make whatever minor repairs might be necessary. The track is also set-up for unofficial races. Saturday is race day! While the race day runs most of the day on Saturday, boys need only attend the event during the heats assigned to their age group. The race event consists of a series of heats on our 3-lane track. Each scout will run his car in each lane an equal number of times. All times will be recorded electronically and the winners will be the Scouts with the lowest average times for all the heats. The concours event judges the cars for their design. Scoring will be based upon "originality of design", "color and finish", "accessories and decals", and "use of Cub Scout motif". NOTE: The pack serves Starbucks coffee and donuts in the morning and hot dogs and chips in the afternoon, for purchase by hungry scouts and their parents!